Top photo: Instructor Dan Wells, left, gives some pointers to Ron Deal of Tulare at the Visalia police shooting range northwest of Visalia. Wells teaches four-hour and 16-hour classes on guns. 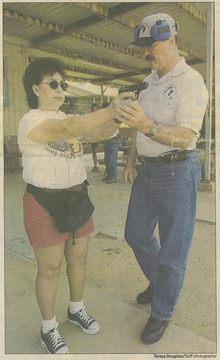 Mary Ellen of Tulare gets instruction from Dan Wells at the Visalia police shooting range. Ellen has applied for a concealed weapon permit. I am life long resident of California, born and raised on a small farm in Tulare County, California. I grew up shooting BB guns and .22 caliber rifles and was a very good shot. After graduating from high school 1964 and attending one semester of college, I joined the U.S. Air Force in 1965. After boot camp, I attended the Air Force Police Academy and began my career as an Air Force Policeman. I am a qualified expert with the rifle, pistol and shotgun with both my right and left hands. After leaving the Air Force in 1969, I worked as a police officer in a small town and attended the local police academy. Then I joined the Tulare County Sheriff’s Department for several years. While I was with the sheriff’s department I was a member of the only Riot Control Team that Tulare County ever had, and was a sniper on the STEP team (Special Tactical Enforcement Personnel). I attended Advanced Officers School and the FBI Major Crime Scene Investigation School. I then left the Sheriff’s department and obtained my license as a California Private Investigator and ran my own investigation agency for the next twenty six years until I retired from that business in 2001. I was a youth baseball coach, Captain in the California State Military Reserve, Trustee on the Tulare County Board of Education, District Administrator of District 34, Little League Baseball and charter member of Chapter 441, Vietnam Veterans of America. 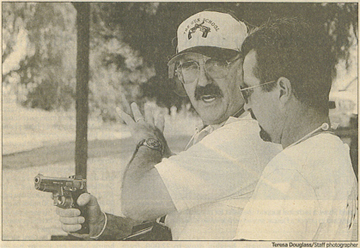 In 1987, I attended the NRA Security & Law Enforcement Firearms Instructor Development School in Raton, NM. I then attended the California P.O.S.T. Rangemaster/Firearms Instructor School in Fresno, CA. In 1988 I obtained a license from the California Bureau of Security & Investigative Services as a firearms instructor and began my career teaching security officers and civilians a sixteen hour basic firearms course at the College of Sequoias in Visalia, CA. I later became licensed by the California DOJ as a hand gun safety instructor. In 1999 I started teaching a four hour CCW Firearm Safety Class at the College of the Sequoias in Visalia, CA and at Porterville College in Porterville, CA. I had also testified in Tulare County Superior Court as a small arms expert and range safety expert. In 2008 I took the necessary courses and became certified by the states of Utah and Florida as a CCW Firearms Instructor to teach non-residents so they could obtain a Utah or Florida CCW Permit which is accepted in up to thirty two states. I am currently a CA DOJ Firearm Safety Instructor’s Instructor. I attended FBI Chemical Agent Instructor School in 1991 and then taught Tear Gas Classes at COS. In 2011, I attended Sabre Pepper Spray Instructor School and in 2012 I took the necessary steps to be Certified by Taser as a Civilian Instructor. Pepper Spray and Tasers are very good non-lethal weapons.